Two hundred years ago, Leamington grew and prospered as wealthy visitors arrived for the health benefits of the spa waters. But what of those many people who couldn’t afford to pay medical fees? The building shown offers some fascinating clues to this story. 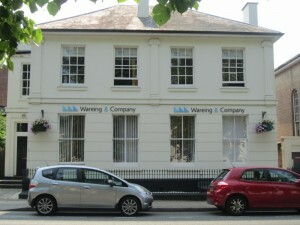 This building in Holly Walk, now offices, was built in the early 1830s as a fashionable residence. In 1875 it became the home of the Leamington Provident Dispensary, which started in 1869 at a small terraced house in Regent Grove, just opposite. A ‘dispensary,’ nowadays suggesting just a place for issuing medicines, was for many years much more besides. It was a clinic that offered a range of health care for working-class people. Charitable dispensaries, growing up in the late eighteenth century to treat the ‘sick poor’, were funded by the prosperous and served by doctors who often gave their services free. Many know the Warwick Dispensary in Castle Street, founded in 1826; Leamington’s first hospital was the ‘Dispensary and Infirmary’ in Regent Street from 1816 to 1831. The first provident dispensary anywhere was founded in Southam in 1823 by Dr Henry Lilley Smith, a local GP. His innovation was to combine charitable donations with small contributions from working people themselves, which would be used to pay the doctor. Smith argued that such ‘provident contributions’ (then a penny for a single person, and 2d for a family) would enhance the dignity of the working man. They would free him both from dependence on charity and the risk of becoming a pauper when illness struck. Three or four medical officers (who made their main living from private practice) each attended the Dispensary in Holly Walk twice weekly. Many people received home visits too, and there were close links with the emerging district nursing service. For a modest extra fee, women could have the services in childbirth of the midwife or one of the doctors. Other staff included consultants, a dentist, and eventually a radiologist. 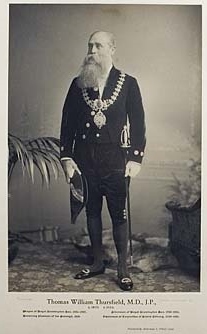 The key figures establishing the Dispensary included two doctors, Thomas Thursfield and James Fenn Clark, together with Alderman Henry Bright, one of the borough’s earliest mayors. A later medical officer, Arthur Tomkins, retired in 1918 after 39 years’ service; but he is best remembered as a player in Leamington’s historic 1874 tennis match. From the detailed statistics that the staff collected, it is possible to trace the transformation in health patterns between 1870 and 1914. Local people were less likely to suffer early deaths from infectious diseases and but instead were more and more prone to the heart disease and other chronic conditions so familiar today. From 1913 the introduction of the Lloyd George health insurance system led to working men joining the panels of local GPs. Their wives and children, not covered by the scheme, still attended the dispensary (or the Friendly Societies’ Dispensary in Portland Street –but that’s another story). These arrangements continued until the start of the National Health Service in 1948, and indeed such Institutions pioneered many things still seen in the NHS. So they were significant, if little recognised today. No doubt there are some Leamingtonians who have their own memories from attending as child patients, and might be interested to offer their recollections.